Families on the go have come to love the versatility, athleticism and affordability of compact crossovers like the Nissan Rogue. 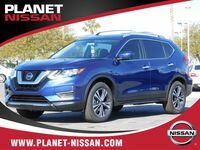 A popular entry in the Nissan stable of vehicles, the 2019 Nissan Rogue in Las Vegas, NV is more advanced than its predecessor – adding a wealth of innovative safety systems that will cater to your family. 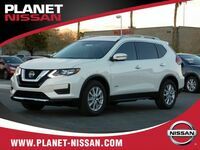 Gear up for your next family adventure and get behind the wheel of the 2019 Nissan Rogue today at Planet Nissan! Do you have your heart set on a Nissan Rogue? 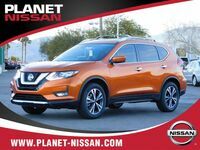 Drivers who choose the 2019 Nissan Rogue at Planet Nissan will have a choice of three trim levels – S, SV and SL – that will start at just $24,920*. With room for five passengers in a cabin that provides 105.8 cubic feet of passenger space and 39.3 cubic feet of cargo space behind the second row, the Nissan Rogue is tailor-made for long road trips or day-to-day errands. When you are faced with larger chores, the 60/40 split-folding rear seats can be laid flat to provide you with 70 cubic feet of cargo space. $2,500 Nissan Customer Cash. Rebate cannot be combined with special APR. Please See Dealer for details. What Are the 2019 Nissan Rogue Engine Options, Specs and Features? 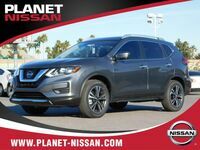 An athletic style is complemented by an athletic performance when you slide into the driver’s seat of the 2019 Nissan Rogue in Las Vegas, NV. 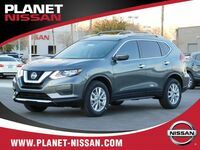 At the heart of the 2019 Nissan Rogue, you will find a capable 170-horsepower 2.5-liter four-cylinder engine that will manufacture 175 pound-feet of torque. Married to a fuel-efficient Xtronic CVT® (Continuously Variable Transmission), front-wheel drive Nissan Rogue variants will earn 26 mpg in the city and 33 mpg on the highway**. With the addition of Intelligent All-Wheel Drive, the Nissan Rogue will upgrade performance on rough roads and when faced with inclement weather. When properly equipped, the Nissan crossover will tow up to 1,100 pounds of cargo. Families who put an emphasis on frugal fuel economy will find that the 2019 Nissan Rogue Hybrid fits the bill. Armed with a refined 2.0-liter four-cylinder gas engine that is paired with a high-torque electric motor, the Nissan Rogue Hybrid will manufacture 176 horsepower. With an Xtronic CVT® under the hood, the Nissan Rogue Hybrid will achieve 33 mpg in the city and 35 mpg on the highway**. Available in two trim levels – SV Hybrid and SL Hybrid – the fuel-efficient Nissan Rogue Hybrid is available in front- and all-wheel drive formats with Nissan Intelligent All-Wheel Drive. When you hit the road with family and friends, safety is top priority and the 2019 Nissan Rogue will check all the boxes with standard Lane Departure Warning, Intelligent Lane Intervention, Automatic Emergency Braking with Pedestrian Detection and High Beam Assist technology. An upgrade to the Nissan Rogue SL will add the Nisan ProPILOT™ Assist system. 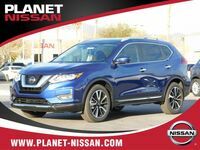 Highlights of the Nissan Rogue spec sheet include 17-inch wheels, Nissan Intelligent Key™ with Push Button Ignition, a power liftgate and a 7-inch NissanConnect touchscreen infotainment system with Apple CarPlay and Android Auto capabilities. 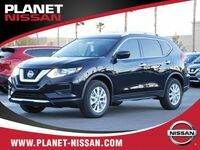 Visit Planet Nissan today to get behind the wheel of a 2019 Nissan Rogue! *Price is Manufacturer’s Suggested Retail Price (MSRP). MSRP excludes tax, title, license, options and destination charge. Dealer sets actual price. **2019 EPA Fuel Economy Estimates for Rogue®: • 26 City MPG / 33 Highway MPG / 29 Combined MPG for 2019 Rogue FWD (S, SV, and SL trims) • 25 City MPG / 32 Highway MPG / 27 Combined MPG for 2019 Rogue AWD (S, SV, and SL trims) • 33 City MPG / 35 Highway MPG / 34 Combined MPG for 2019 Rogue Hybrid FWD (SV Hybrid and SL Hybrid trims) • 31 City MPG / 34 Highway MPG / 33 Combined MPG for 2019 Rogue Hybrid AWD (SV Hybrid and SL Hybrid trims) Actual mileage may vary with driving conditions — use for comparison only.